Artful Affirmations: December Celebration Giveaway and Sale! Oh Terri this is generous of you to give away this beautiful piece ! Have a good time Terri! 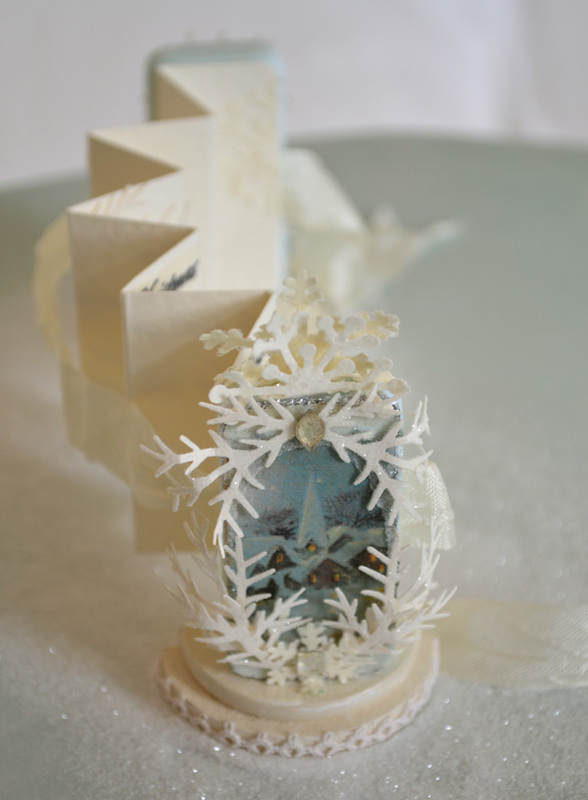 What stunning creations - I just love following your blog - so many works of art that are so original. I don't know how you could bear to part with any of them - but what a wonderful and generous gesture this time of year. If I was lucky enough to win it - I would treasure it forever and take great pleasure in recounting the story of it's making and what makes 'it' so special. Hope I win. I adore your birdcage, your sis is lucky! I love the birdcage you have created and the quote is so inspiring, the bracelet is gorgeous too. Your sister's gift is stunning and the quote is uplifting! Dear Terri, your jewelry`s are stunning, I so admire all of the ones you have shown here,lately. And this beautiful piece for your sister, is just amazing. Also a very special bracelet in your giveaway, with all the other wonderful gifts. So many beautiful creations! Your sister is going to love it! Oh Terri i just LOVE your birdcage with the quote!!! 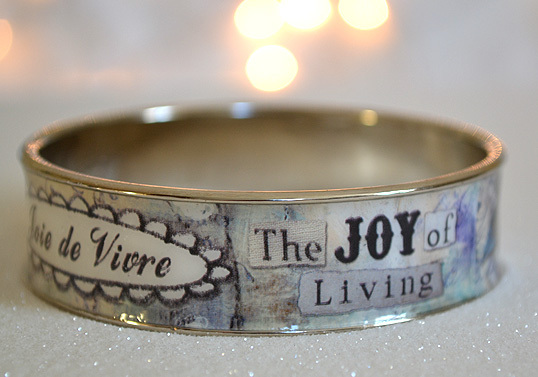 That bracelet speks to me in so many ways- i know that "joy" is a fave word of yours as it is mine. What a beautiful and generous gift to give away! Thank you. What an amazing bracelet! You are too generous with your giveaways, Terri. You are such a sweet soul to share so much of yourself and your creativity. Very, very special. You are such an inspiration and you were one of the first bloggers I began following and of course your blog is ALWAYS posted on my side bar. Have a very lovey Holiday Season! love love your giveaways and all of your art..love the bracelet...you are generous in you giftgiving, thank you. Inspirational! Your sister is so lucky. Wow, Terri, what a marvellous collection of gifts and how wonderful of you to give them away. I will admit that the bracelet has stolen my heart, so gorgeous and such beautiful engravings. I'm now wondering if I can type with my fingers crossed! I took your domino book class and haven't uploaded my pictures yet, but you are such an inspired teacher. I LOVE your design aesthetic. Are we going to see pictures of the inside of your christmas book? PLEASE! this is all so beautiful terri!! I am very busy to crate christmas prsents, can't show them yet! Hugs from France! what a beautiful bracelet, Hope I win it! Thank you for thr opportunity! It's always a special treat visiting you Terri! Everything is beautiful! Of course I do not want to enter for gifts, I have won from you already, but I can't get over how beautiful everything is! The bracelet, your domino book, and that necklace is sooooo fantastic! I love ut all! These are all so beautiful!! Thank you for the chance to win. Hi Terri, I have a been follower of yours for quite a while, I love your tea cups. Wish I lived close to you so we could share a cuppa. Thank you for all the lovely tutorials you do too. I am truly inspired by your work. Thank you for your giveaways, you are so generous. The bracelet is just lovely. Please enter me in the giveaway contest, again! It would be a thrill to win any of your giveaway gifts. What creataive, beautiful way to spread the meaning of Christmas. God Bless you and your family. The bracelet is beautiful. This is a very generous giveaway. Thank you! How lovely is that bracelet? I love it and would wear it all the time! Thank you for offering this pretty, pretty piece. Oh I have to try this. All the things you are showing are just so beautiful. maybe I will win so now I try. What a beautiful giveaway! I just started following you & love your blog. Merry Christmas! who wouldn't love a free on-line domino book class..i know i would! love the birdcage you made for your sisters birthday. have a lovely time at your party tomorrow!! I love you work...so inspiring! I first found you on YouTube by accident but truly enjoyed the crepe flower, fairy school, and so I signed up to receive blog update emails and have enjoyed all of the emails including the tea cup Tuesday's! I started collecting them (originally to create a pin cushion), but I couldn't bring myself to do it! Lol. So thanks for being so inspirational & thank you so much for giving us an opportunity to win! Happy holidays to you & your family! Terri you are so generous in your giveaways! I have thoroughly enjoyed your blog and linking up on Teacup Tuesdays, even though I don't think I do this often enough! All the best to you and yours for the festive season. more beautiful creations! would love to win! cheers! Becky V.
athank you, Terri for stopping by my blog and leaving lovely comments! Love the exquisite gifts, especially the bracelet! Thank you for leaving such a sweet comment on my blog re. paper and fabric dolls. Your jewellery here is just gorgeous - that bracelet and pendant with such thoughtful words. 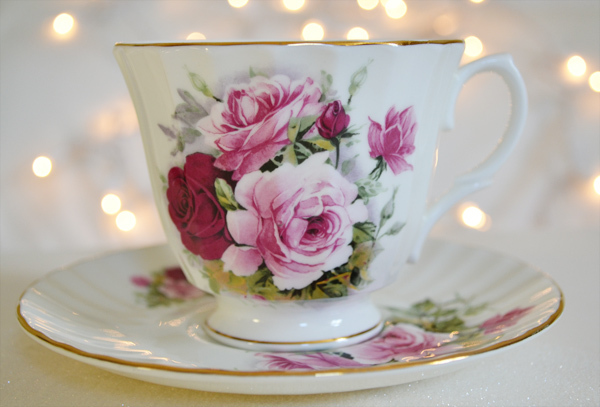 It would be a joy to win the braclet, workshop or such a stunning vintage cup and saucer set of roses (my favourite!) so please count me in with much gratitude! I have just placed your Giveaway on my sidebar! AND have my fingers crossed! Your birdcage pendant came out beautifully. I love the color scheme! oh, how I love your blog and would be so happy if i could win the wonderful giveaway. Imam glad to read you are feeling better. Your latest blog is gorgeous. I would love anything that I might win. Thank you for the generous giveaways! I think your weekly emails are so delicate, lovely, and life affirming. I thank you for the gift of them. Uh Oh! I think I left my comment too many times.............I need to learn to blog more! Oh goodness- how fun that I came across your post! I was looking for a tutorial on pinterest for match boxes and one of the pictures directed me here! NOt sure your giveaway is still going but I would love to be entered if it is! Terri, I just signed up for your Altered Domino Book class and am very anxious to begin. I have just moved to NC after a lengthy absence from my creative working schedule. Your class will help me to get back on track as I love making all kinds of books. Your "Peace on Earth" domino book is very inspiring and truly a wonderful book. Have a very good holiday and Peace on Earth in the New Year. highest quality sites on the net. I most certainly will highly recommend this blog!